If you’ve heard of the IB Diploma Programme (DP), you might also have heard of CAS*, one of the cornerstones of the programme. If you haven’t, before we get to the research, here’s a mini introduction. All DP students participate in CAS, as part of the unique DP learner experience. CAS involves students in a range of activities, such as artistic expression, sports and community service, to accompany and support academic studies. So, now to the research. What do students, teachers, and alumni think about CAS and its perceived outcomes? Researchers at the University of Bath have investigated the impact of CAS through the perceptions of those involved in the programme, past, and present. Surveys were collected from nearly 8,000 students, almost 500 CAS Coordinators and more than 900 DP alumni across the world. 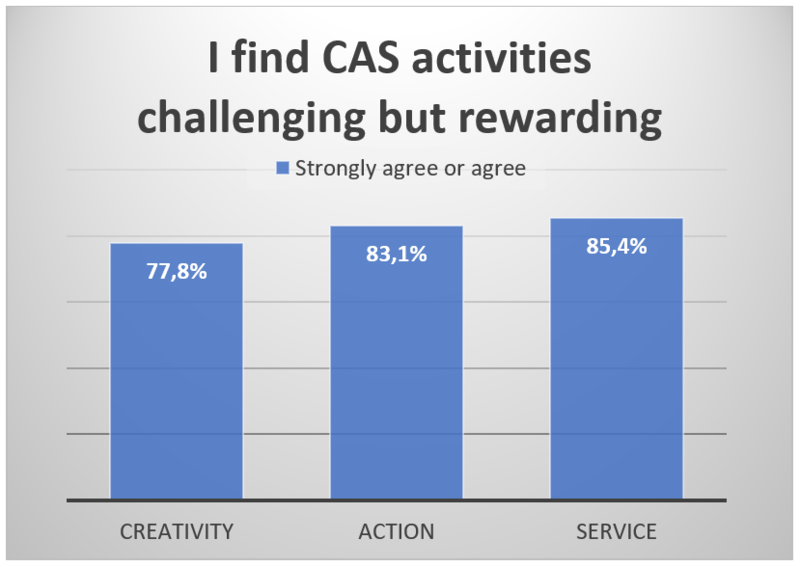 Perceptions of CAS as challenging but rewarding: Students perceive CAS to be a challenging element within a challenging programme, but also agree it is rewarding. Students identify “service” as the most difficult of the three strands (85% agreement) but also rated this as the most rewarding (see figure 1). With regard to IB Learner Profile attributes, CAS seemed to have the least impact on the development of the “inquirer” attribute, and the greatest impact on the development of the “communicator” attribute. Any good practice tips for implementing CAS? Coordinators in this study suggested that a successful CAS programme depends on identifying CAS activities that students consider to be both meaningful and enjoyable. Consistently, two variables were found to be important for successful CAS implementation: students perceiving CAS as a valuable use of their time and goal setting before beginning CAS activities. Students identified five factors as supporting a successful CAS experience. Read the Research Snapshot (two-page overview); the Research Summary (summary of the study’s main findings) or the Full Report by the researchers. *The ‘activity’ component of CAS was formerly named ‘action.’ In the research study discussed in this post, vocabulary was used from the 2008 Creativity, action, service guide—creativity, action, service—is used to reflect the language of the stakeholders at the time the study was undertaken.